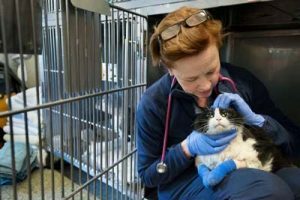 As massive wildfires rage across California, the American Veterinary Medical Foundation (AMVF) is working to help veterinary colleagues and animals in need. The Carr Fire, a week old, is the sixth most destructive fire in California history, destroying nearly 1,000 structures and claiming several lives. With less than 30 percent containment achieved and continued hot, dry, and windy weather conditions, it’s expected to worsen before headway is made. The AVMF has been in contact with several area animal clinics that are not only inundated with emergency cases, but also caring for animals that residents could not take with them when evacuating on a moment’s notice. The AVMF, which grants to veterinarians to ensure emergency medical care of animal victims and relief grants to help veterinarians and veterinary students who require basic necessities due to a disaster, is seeking support in its efforts to help as many colleagues as possible. Donations to the AVMF Disaster Relief Fund can be made at avmf.org/donate. Use the AVMF Code “Disaster Relief” when filling out the donation form. These fires serve as a reminder of the importance of disaster preparedness. There’s no better time than now to create or review your disaster plan and talk with clients about how they can be prepared to evacuate with their animals if necessary, stated the AVMF. Below are resources emergency preparedness plans and for client conversations. Since September 2017, the AVMF has provided more than $250,000 in relief and reimbursement funds to AVMA members and others who lost essential items or delivered emergency support during natural disasters.